All good things must come to an end, and it’s almost time to bid farewell to summer. End the season on a high note with delicious food, fun, friends and family at a special end-of-summer party! Whether you are hosting your own bash or have been tasked with bringing a side dish to one, these delicious potluck/cookout ready ideas are fool-proof. Crack open a jar and get creative! 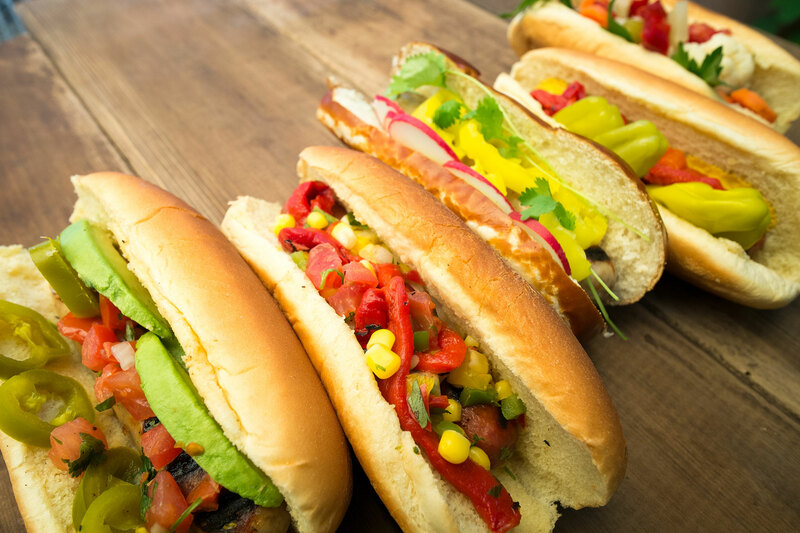 Get inspired, light up the grill and get cooking! Create a plentiful antipasto platter by pairing Spicy Italian Olive Antipasto, Whole Golden Greek PeperonciniMarinated Artichoke Hearts and Garlic Stuffed Olives with a selection of gourmet cheeses and cured meats. Slice up Garlic Stuffed Olives and or Jalapeño Stuffed Olives and mix them into a cheese dip for a delicious and colorful retro party dish. Top deviled eggs with slices of Jalapeño Stuffed Olives. Serve Castelvetrano Olives Wholeor Pitted as a quick and addictive snack by themselves or alongside Spanish Marcona almonds and Manchego cheese. Mash avocado in a bowl and add chopped Jalapeño Stuffed Olives and or Diced Tamed™ Jalapeño Peppers along with diced tomato and a squeeze of lime for an unforgettable guacamole. Combine diced Sliced Hot Cherry Peppers with sour cream, lime zest, minced cilantro and hot or mild chili powder for an addictive taco dip to serve with tortilla chips. Combine Diced Tamed™ Jalapeño Peppers with diced tomatoes, diced red onion, lime juice, minced cilantro and salt to taste for a fresh and spicy salsa. Make a refreshing salsa with Sunshine Mix Mild Banana Pepper Rings, fresh tomatoes, onion, cilantro and lime juice. Mix diced Jalapeño Stuffed Olives into burgers, grill and top with melted cheese. Place shredded cheddar cheese and Jeff’s Naturals Diced Tamed Jalapeños into the center of a burger patty before grilling for a delicious surprise. Give your burger a Mediterranean Burger by topping it with feta cheese, Organic Sliced Kalamata Olives and Sun-Ripened Dried Tomatoes. Top your cheeseburger with Sunshine Mix Mild Banana Pepper Rings for a cookout sensation. Top hot dogs or brats with Sliced Tamed™ Jalapeños, Roasted Bell Pepper Strips and/or Sunshine Mix Mild Banana Pepper Rings. Add diced Jalapeño Stuffed Olives and Roasted Bell Pepper Strips to a Southwestern black bean salad. Toss Marinated Artichoke Hearts with chilled cooked pasta, Sun-Ripened Dried Tomatoes, fresh basil, lemon juice, and olive oil for a light yet satisfying pasta salad. Mix Marinated Artichoke Hearts into potato salad along with Roasted Bell Pepper Strips and diced red onion. Dress up your favorite pasta or potato salad recipe with a few spoonfuls of Imported Non-Pareil Capers. Toss Sun-Ripened Dried Tomatoes with chilled cooked pasta and sliced Pitted Castelvetrano Olives and Roasted Bell Pepper Strips for a colorful and delicious pasta salad. Need more inspiration? 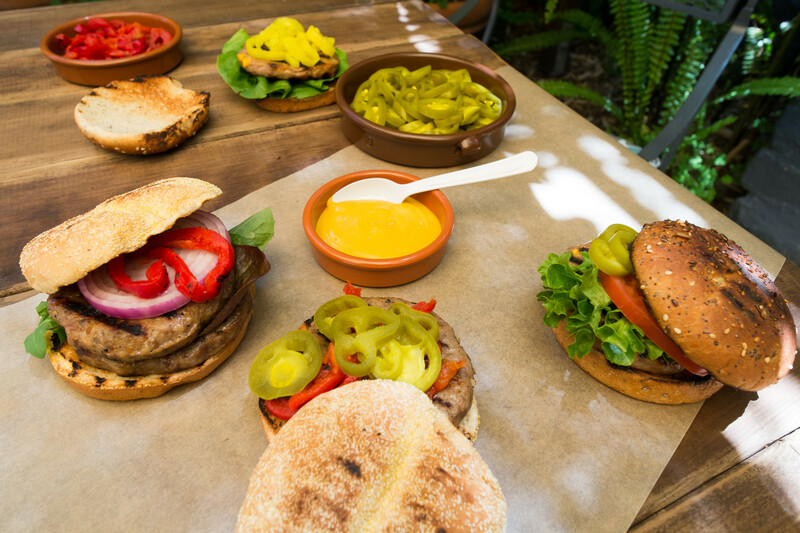 Click here for a round-up of some of our favorite All-American Cookout Classics with a Mediterranean twist. Fresh from the Jeff’s Naturals Kitchen…. The Jeff’s Naturals chefs have been hard at working creating fresh innovative dishes you can easily bring your table! 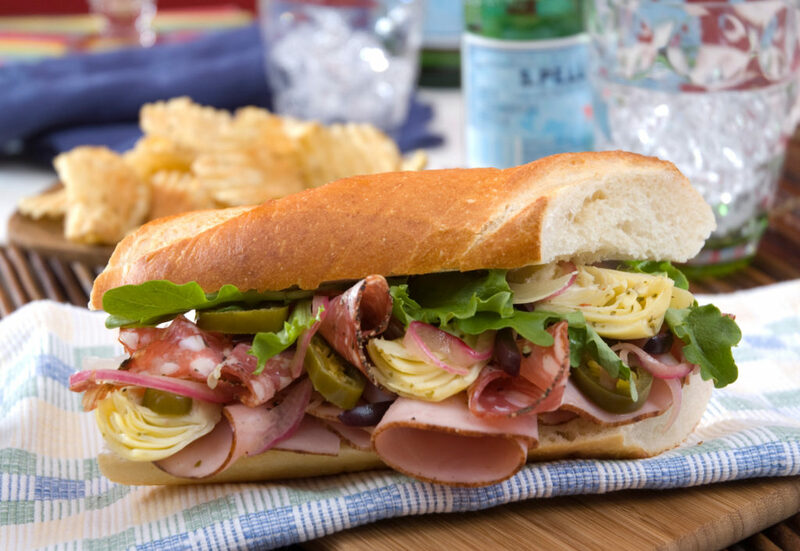 During the summer season, simple gourmet sandwiches rule! 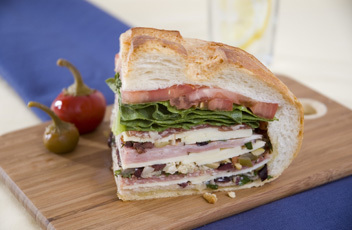 If you are looking for the perfect sandwich, our new Prosciutto Pear Sandwich fits the bill! The combination of roasted bell peppers, salty capers, Gorgonzola cheese, prosciutto and fresh sliced pear will take you on a flavor adventure! It’s the perfect summer sandwich. Make it in advance and enjoy on a summer picnic or lunch on-the-go. 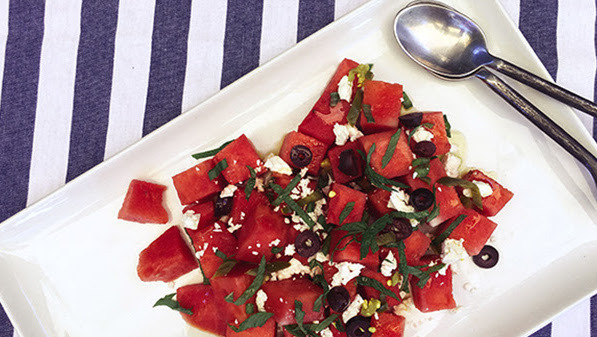 You can even pair it with a green salad and fruit for a simple summer supper! The possibilities are endless. Enjoy! In a small bowl, combine the Gorgonzola cheese, crushed garlic, non-pareil capers, pine nuts, 1/2 teaspoon black pepper, and 4 tablespoons of the olive oil. Mix well, and set aside. 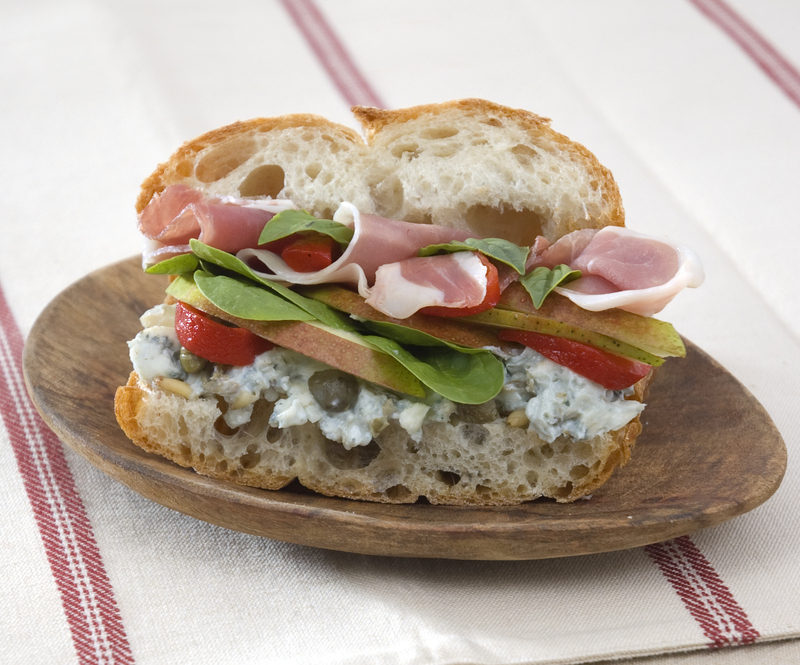 Spread one side of each sandwich roll with 2 tablespoonfuls of the Gorgonzola cheese mixture. Next, layer each sandwich with 2 oz. prosciutto, 3 slices of pear, and some roasted red bell pepper strips. Top each sandwich with several spinach leaves plus a few basil leaves. Drizzle the greens with a dash each, olive oil, sea salt, and additional black pepper, if desired. Fold the sandwiches closed, and broil, on the center rack, for about 5 minutes, or until bread is just toasted. Enjoy! 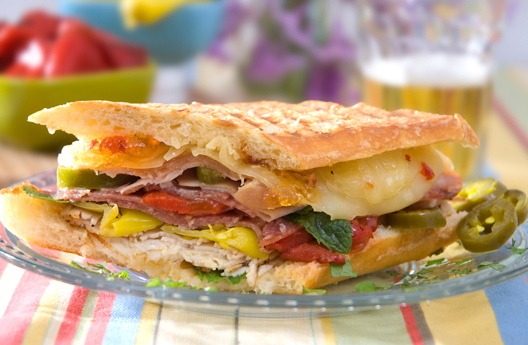 New Sandwich Ideas Featuring New Sunshine Mix Mild Banana Pepper Rings! 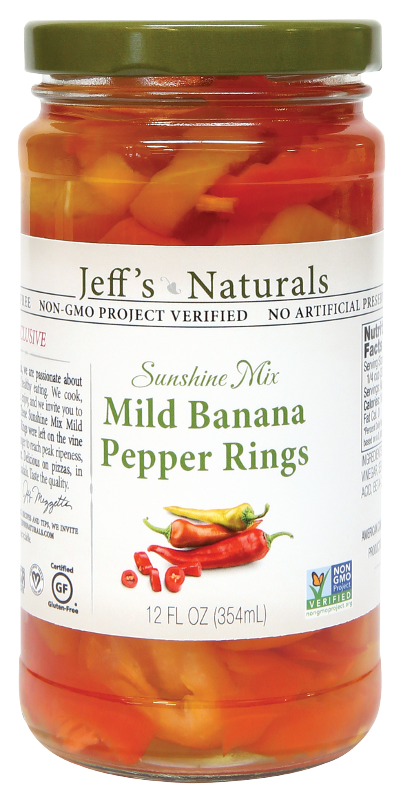 We are so thrilled to announce that Jeff’s Naturals has added a delicious medley of Banana Pepper Rings to our already robust line of all-natural line of olives, peppers, capers and sun-dried tomatoes! Say hello to our colorful and delicious Sunshine Mix Mild Banana Pepper Rings! These mildly flavorful peppers are sourced from local family farms in Northern California and harvested July through September. They are delicious on everything from pizzas to sandwiches, from salads to omelets and a variety of recipes like these (fresh from the Jeff’s Naturals Kitchen)! Evenly divide arugula onto bottom halves of the sub rolls. 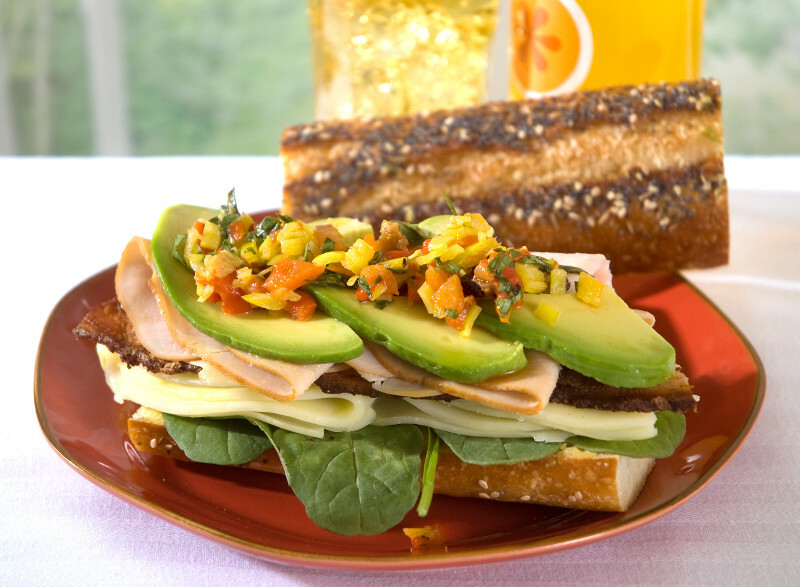 Top with the turkey, cheese, bacon and avocado. In a small bowl, stir together the bell peppers, banana peppers, figs, basil, and lemon zest, until well combined. Spread mustard on both side of the bread. 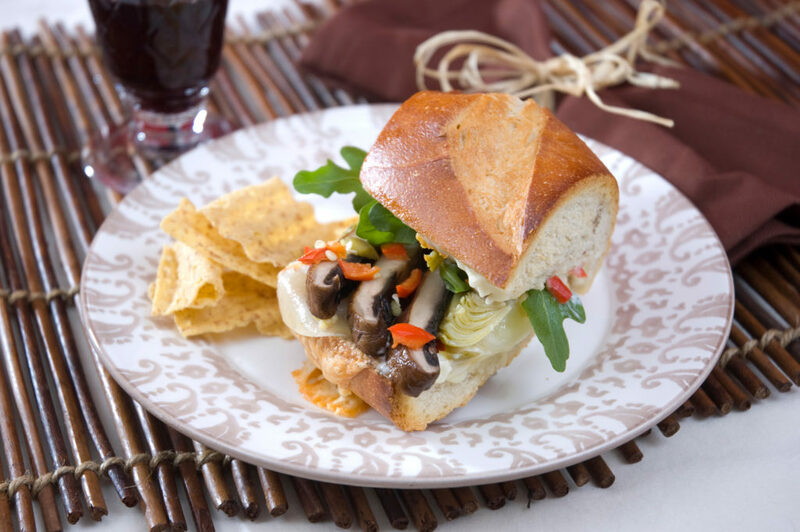 Evenly divide mixture among the sandwich rolls, cover with roll tops and serve. In a small saucepan over medium heat, bring Jalapeño jelly and diced Jalapeño peppers to a boil, reduce heat, simmer 3 minutes. Remove from heat and stir mint in until blended. Pour mixture in a small bowl, set aside to cool for about 5 minutes. In the meantime, heat a sandwich grill or a heavy skillet. Brush the sandwich spread onto the insides of both the top and bottom pieces of bread. 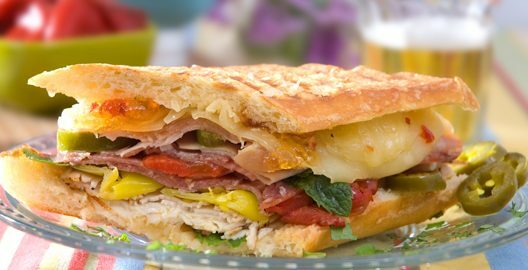 Layer the sandwich as follows: turkey, salami, prosciutto, black forest ham, cheese, banana peppers, roasted bell peppers, salt, and ground pepper. Close sandwich and cut into 4 equal pieces. Brush top of the sandwich with butter, set sandwich, butter side down, on the sandwich grill or skillet. Brush butter on top side of bread and place on the grill or in a large skillet. To evenly press the sandwich, place a heavy skillet, or a brick wrapped in foil, on top of the sandwich. Cook until nicely browned and the cheese is melted, turning once, 3 to 4 minutes on each side. You know what they say, “If you can’t stand the heat, get out off the kitchen”! Nothing could be truer on a sweltering summer day. But you still have to eat! What to do? Not to worry, we have you covered. Anyone can prepare delicious dishes using Jeff’s Naturals all-natural line of olives, peppers, capers and sun-dried tomatoes. Our recipe catalog is chock full of ideas you can use to prepare meals that are not only delicious and refreshing, they come together effortlessly without the heat! 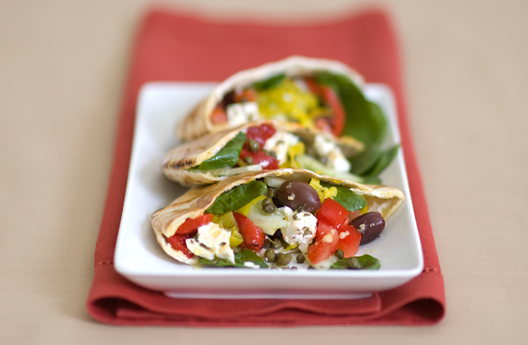 Here are some “no cook” recipes to dash up delicious meals without having to turn on the stove! In a mixing bowl combine the tomatoes, spinach, cucumber, feta, olives, peperoncinis, sweet bell pepper strips and capers. In a separate bowl whisk together the olive oil, oregano, lemon juice, and crushed garlic. Once ready to serve, toss the dressing with the vegetables. Cut the pita rounds in half and divide the mixture evenly among the 8 pita rounds. Strain yogurt through cheesecloth to remove excess water and milk. Add all ingredients into a blender and blend until smooth. Chill and serve cold. 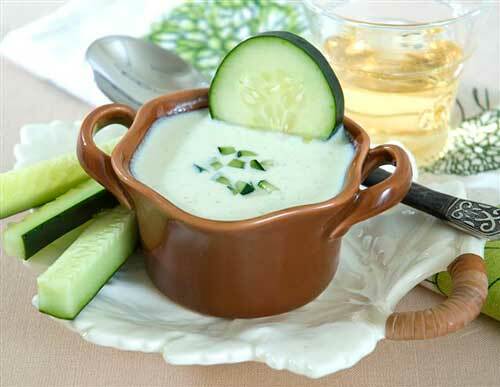 Chef’s Note: Serve as shooters for a small appetizer, as a summer soup, or as a sauce for a light and healthy fish dish. Finely chop the vegetables and olives for the olive salad. Combine all salad ingredients; set aside. Cut the loaf of bread in half crosswise. Use a small, serrated knife to score the inside of both halves about 1″ from the crust. Hollow the bread halves by pulling out the insides with your hands. Leave shells about 1″ thick. Save the bread chunks for other uses. Spoon salad into bottom half of loaf. Layer 2 oz. cheese over the salad. Top with one type of meat; repeat. Finish layering with last of cheese and meat. Top with tomato and lettuce. Use an electric knife to cut the sandwich into four wedges. If you don’t have one, use a very sharp serrated knife. Just saw carefully and don’t press too hard–or you might squish the entire filling out. Muffulettas can be served hot or cold.